Hatred and Discipline are the Demon Hunter's twin-resources. The system works very much as it was described in a series of interviews in February 2011. Hatred is generally spent to fuel offensive attacks that are the Demon Hunter's main damage dealers. Hatred has a fairly large pool (100 at base) which refills quickly, at a rate that can be accelerated by item modifiers and other skills. Several of the Demon Hunter's ranged basic attacks are Hatred generators that add X points of Hatred per shot -- thus faster attack speed allows for a speedier Hatred refill -- though expert Demon Hunters tend to manage their Hatred resource with faster and more efficient refilling techniques than the basic hatred generating skills. Discipline is generally spent on defensive or support skills; not on direct damaging attacks. Discipline has a smaller pool (30 by default) than Hatred and refills at just one point per second. Only a few items increase the Discipline regeneration rate, though it's not as hard to find items (Cloaks, Quivers, and some Bows/[[Xbows) that add to the total size of the Discipline pool. Discipline can also be refilled by various skills, either all at once or more gradually. See the Demon Hunter skills page for specific details on which skills use Hatred and which use Discipline. Increased Hatred regen rate modifiers can be found on quivers and bows/xbows, as well as some specific legendary items. Increases of up to 10 to the Discipline pool can be found on quivers and cloaks. Natalya's Wrathitem set offers +2 Discipline regen per second with 4 items equipped. Vengeance: Your maximum Hatred is increased by 25. In addition, gain 20 Hatred and 2 Discipline whenever you are healed by a health globe. One of the most popular Demon Hunter passives, this provides almost infinite Hatred, and helps with Discipline as well. It can spur a very bold play style, allowing a Demon Hunter with good DPS to continually advance, counting on new health orbs to drop regularly enough to heal and keep the Hatred flowing. Night Stalker: Critical Hits have a chance to restore 1 Discipline. A great option for characters with high Critical hit chance, this provides a steady rate of refill that can really add up during pitched battles with numerous enemies. Perfectionist: Reduces the Discipline cost of all skills by 10%. Increases your Life, Armor and all of your resistances by 10%. One of the Demon Hunter's few buffs, this is mostly used for the life and defensive bonuses. Grenadier: Increases Hatred generated from Grenades by 2 and reduces the Hatred cost of Cluster Arrow by 10. Upon death, you drop a giant grenade that explodes for 450% weapon damage as Fire. A must for certain builds, but fairly specialized. Hatred Generators: [Hungering Arrow]], Bola Shot, Entangling Shot, Grenades, and Evasive Fire all generate some points of Hatred per use. (Their rune effects have some special wrinkles as well.) Note that faster attack rate is very useful as it allows more attacks in a shorter period of time. The Bat acts as a buff that boost Hatred regeneration by 3 per second. This is a mandatory skill to run with a number of high Hatred cost builds. Multishot: Fire at Will cuts the Hatred cost by half, and is by far the most popular rune effect in this skill. Many other skills have variations on resource cost in the rune effects, so look over the options carefully while playing. The Demon Hunter was the last class to be revealed and was still under construction well into 2012. When first seen at Blizzcon 2011, the DH used mana for all skills, much like any of the classes in Diablo 2. Even then the developers had an idea of the sort of resource system they wanted to harness to the character. The basic system was first described in February 2011 during interviews with Christian Lichtner and Jason Bender. Jason Bender: "We’ve split their kit into the idea of discipline – prepared, deliberate, precise – a character who builds his traps ahead of time and knows every weakness of his enemy and exactly what he has to do to take it out. Then there’s hatred, this almost blind drive – they can’t stop themselves from getting involved which means they’re probably angry at themselves for having that taint and it makes it worse. So they’re obsessed in that way. Their skills match that: They have some very aggressive skills that come out of that hatred school, and they have discipline skills, that deliberate, intentional preparedness." "...the inspiration for what we’ve done since then has been based on this idea of aggression and hatred versus discipline and self-mastery. So, the skill set definitely reflects those two schools of thought and the resource system reinforces the skill set accordingly. But we’re still testing it and making sure it really plays as smoothly as we want it to." More details came in an interview with Gamespot where Jason Bender and Christian Lichtner talked about the Demon Hunter. Jason Bender: "So with their resources and their skill trees, we split their skills into the categories of discipline, including traps, preparation, things that take a lot of forethought, and hatred, which is the red-eyes insanity the fuels their high-powered burst attacks, alpha strikes, multishots, flame arrows, and things like that. 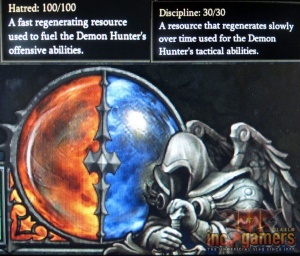 [The demon hunter] really feels more visceral, and there’s some interesting interplay in the resource system that allows you to switch back and forth between your discipline abilities and your hatred abilities. It’s a little more complex and nuanced than some of the other classes; it’s a class about precision and playing [one skill set] off the other." "...we want the demon hunter to have some highly regenerative, more accessible hatred abilities that he always has up and can use to zip around and keep the pace [of combat] up. But then the discipline side tends to be a more precious resource that you have to manage a lot more carefully. You really pick and choose when you want to use your discipline abilities because they make a big difference in how you escape, how you set up an attack…things like that." "Some abilities use hatred; some use discipline. That’s where we’re at in development. But we want to make sure you’re bouncing back and forth between the two without having to switch a stance or anything cumbersome like that. So you’ll have abilities from both camps accessible at all times, depending on how you build your character. Some demon hunters may focus on hatred, with lots of shooting and moving around, and try to amp up that ability as much as possible, while some may focus on discipline instead. [Either way], the default path is going to be a little of both." H/D with tool tips displayed. When Demon Hunter was announced, she used mana at Blizzcon 2010, but that was only as a placeholder. The developers weren't sure about what sort of resource the class might use in long-term. Question: "Any clue about the resource for the Demon Hunter?" Jay Wilson: "If I knew I would give you a clue. We decided not to worry about her resource until after Blizzcon." The first hints at a proper resource for the Demon Hunter came from the developers when the male version of Demon Hunter was revealed. Only a few comments were made by the development team, but it was widely speculated that her resource will have something to do with the balance between discipline and hatred. (X) = the level at which the skill becomes unlocked. This page was last edited on 18 February 2013, at 12:06.